Think you know what the letter G looks like? Think again. Think you know your alphabet? It's a skill drummed into us from an early age, but have we forgotten the fundamentals of letter shapes as we move away from handwriting and spend more and more of our time on digital devices? A recent study by Johns Hopkins University certainly explored the role of writing in learning letter shapes, and questioned whether or not massive exposure leads to more accurate and accessible knowledge. 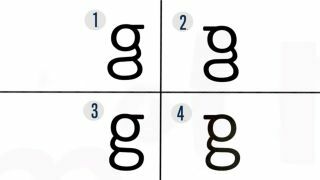 Part of the experiment invites viewers to complete the seemingly simple task of identifying the correct letter G from a lineup of four variants. But is it really that easy? Take the test for yourself with the video below. How did you do? Even though the letter G has appeared multiple times in this article, we still can't blame you for guessing an incorrect version. Everyone on our team got it wrong and letters are kind of our trade. In fact, a startling number of people appear to have trouble choosing the correct letter shape. As graduate researcher Gali Ellenblum points out, many participants "have no idea what they are talking about" when it comes to the letter G.
To discover the reason behind this inconsistency of lettering knowledge, watch the team explain in the video below.